This Mother's Day, introduce your Mom to Laurier Blanc, an online destination for eclectic home decor, found objects, and accessories. Suzanne Coppola, the visionary behind Laurier Blanc, brought together her love of travel with her passion for decor and design. Suzanne travels the world, sourcing home decor items from local markets and vintage shops. Passionate about giving back, Laurier Blanc partners with a new charity each quarter, donating a portion of each sale's proceeds. They have partnered with Heroes for Children for this Mother's Day. This beautiful Alma Porcelain Lace Container will delight any special lady. 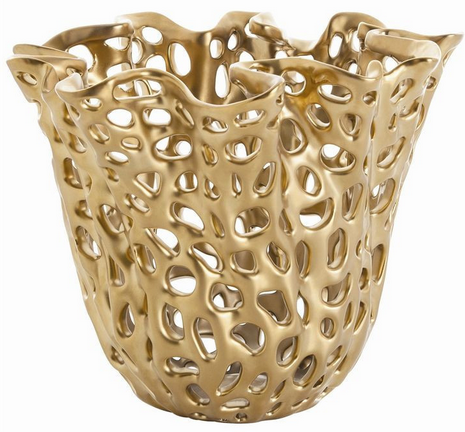 Lace is all the rage in woman's fashion, from shoes to coats, so a gold lace porcelain cachepot makes perfect sense. 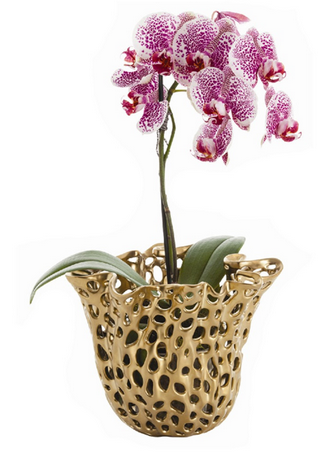 This stunning Lace Container measures 8" tall, 10" wide, and 7" deep. Visit www.laurierblanc.com for lovely gifts for Mother's Day or any special occasion! Enter to win the Alma Porcelain Lace Container! To enter, just fill in the giveaway form below. Open to US residents, ages 18 and older. One winner. Giveaway ends at midnight on 5/10/2015. Good luck! That is beautiful! I love the idea of putting orchids in it.I also like the Hummingbird Cuff Bracelet. I would love to win this pot and I would love to add the Blue & Silver Ikat Dot Print Silk Pillows to my home. Thanks for the chance. Love this Lace container and the vintage glass decanter set is beautiful! Thanks for the opportunity to win! I like the Gold Oval Two Tier Bar Cart. I love the Eric Raisina Casuble Dress! I like the Caroline Chest. It would go perfect in my master bedroom. The Antiqued Stone French Trough is lovely! Love all the classic-look pieces mixed with the modern chic. Love the Rock Crystal Quartz Headband. It would be fun to wear! Sallora Dresser in Gold is beautiful. Peacock Wide Feather Cuff is gorgeous. I love the Axis Lumbar Pillow. I love the Saarti Blessing Bowl Candles. They are so unique and beautiful!